You can get a great feeling of the meeting from the perspective of the 70-strong attendance by looking at our #SpokesMtg twitter hashtag. For a full set of resources from the meeting, see the end of this article. A green and people-friendly cityscape, good for cycling and walking, attracts talented people, building strong innovative companies and boosting local spending power. “Edinburgh’s world-class and growing cultural sector is extremely dependent on the young” said Michael Johnson, Vice-President of Edinburgh Chamber of Commerce. Cities across Europe demonstrate how local shops benefit greatly from a less car-dominated environment, but local shopkeepers often don’t believe it till they see it. Locally this is shown by Edinburgh High Street and the first stage of Leith Walk. Cllr Lesley Hinds, City Council Transport Convener, emphasised this message and says it needs promulgated to local businesses via bodies like the Federation of Small Business and Chambers of Commerce. Every company, large or small, needs a BUG [Bicycle User Group]. A n effective BUG brings mutual benefit to the company and to its staff. Staff benefit from meeting other bike users and from the ability to influence the company (e.g for decent bike storage); whilst the company gets good PR, a more involved workforce and a place to discuss cyclist needs. The audience was stunned by David Monaghan‘s story of the now 600-strong RBS Gogarburn BUG. 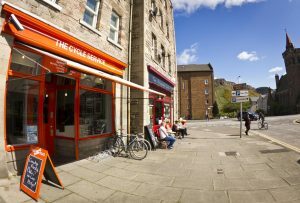 Edinburgh bike trade is benefitting from the big growth in cycling, with a series of new shops opening in recent years, often with their own speciality. Hannah Ward of The Cycle Service told how continued expansion could also bring ancillary activity to the City – such as trade shows and Scotland-based specialist bike-business training. A growing number of small entrepreneurs are using bikes as an integral part of their business – for example cargo bikes for local fuel-free and pollution-free transport. The Edinburgh City/Region deal, a huge investment package aimed to boost infrastructure and employment in South East Scotland, will provide cycling infrastructure but could also support innovative uses of bike transport if proposals come forward. Cycling projects use more local employment in construction and maintenance than do mega-projects, meaning that more cash feeds into local economy – on top of which, the 50/50 Sustrans Community Links funding halves the cost to local authorities of many cycling projects. 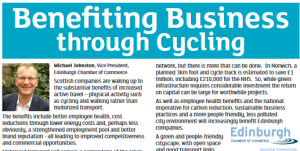 See Sustrans article on p4 of our Benefitting Business supplement. Local business … Michael Johnston, Vice-President, Edinburgh Chamber of Commerce … talk [pdf] an expanded version of the article in our Bulletin supplement. Bike user groups … David Monaghan, organiser, RBS Gogarburn’s Bicycle User Group … presentation [pdf] … See also article in Bulletin Supplement. Local bike trade … Hannah Ward, partner, The Cycle Service … Hannah’s unscripted talk was based on a series of pictures of bike shops & businesses opened in recent years … See also article in Bulletin Supplement. The council … Cllr Lesley Hinds, Convener, City of Edinburgh Council Transport & Environment Committee … most of the talk was unscripted, apart from these slides [ppt] on cycle infrastructure which could be funded under the City/Region deal … See also article in Bulletin Supplement. Audience QA/ panel discussion chaired by Dr Caroline Brown, Assistant Professor, School of Energy, Geoscience, Infrastructure and Society, Heriot-Watt University. Notes of discussion. Summary by Caroline. Cargobike resources … ECF Cyclelogistics Feb 2016 report … Last Mile Logistics [UK company headed by Spokes member Richard Armitage] … EdFoC cargobike for hire … 2015 Spokes cargobike article … Edinburgh Businesses using Bikes . Please RT our tweet of this meeting report!